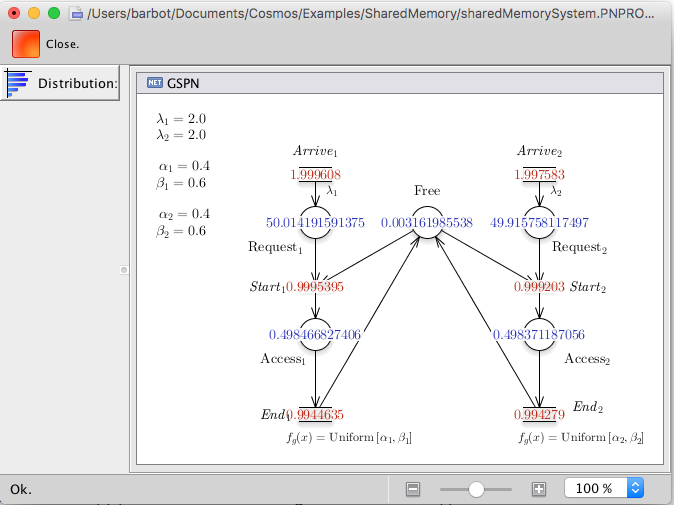 Cosmos takes as input a Generalized Stochastic Petri net with General distribution (GSPN). Figure 1 shows a GSPN modelling a shared memory system. Transitions "Arrive1" and "Arrive2" follow an exponential distribution, "Start1" and "Start2" are instantaneous, and "End1" and "End2" follow a uniform distribution. The native file format of Cosmos is GrML although other file formats are supported: .pnml the iso standard for Petri net file; .gspn a textual file format for Petri Net, .andl the file format for the model checker Marcie; the Prism language is partially supported. In the following, files are also given in the .PNPRO file format which is used by the GreatSPN Editor which provide a convenient way to visualized and edit Petri Net. Figure 2 shows an LHA which measures the difference of memory usage. To compute the difference of memory usage, Cosmos needs the following HASL formula: AVG(Last(OK)) This formula expresses the average value of the variable OK in the final state. Those arguments make Cosmos perform simulations until the confidence interval for the HASL formula has a width smaller than 0.01. Cosmos builds an internal representation of the model and the automaton, using code generation, and then starts the simulation. Confidence interval computed sequentially using Chows-Robbin algorithm. The --help option can be used to show the list of available options. 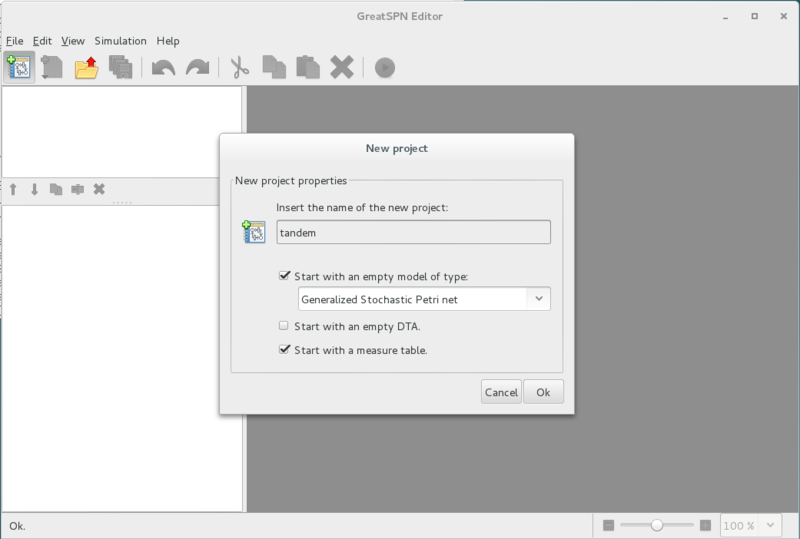 The Petri net Editor of GreatSPN can be used to design Stochastic Petri Net. The resulting Petri net can be exported to Cosmos using the .GrML file format. Alternatively the editor can start Cosmos and display result of simulation inside its graphical interface. Figure 3 : Screen-shot of the GreatSPN Editor showing results from Cosmos. 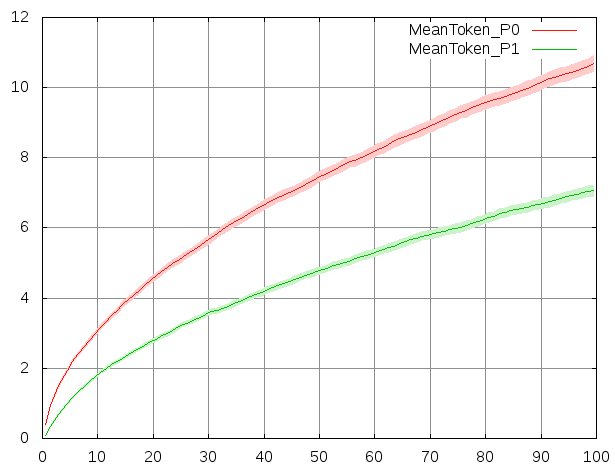 The red numbers are mean throuput and the blue ones are mean number of tokens. Cosmos is integrated inside the CosyVerif platform. 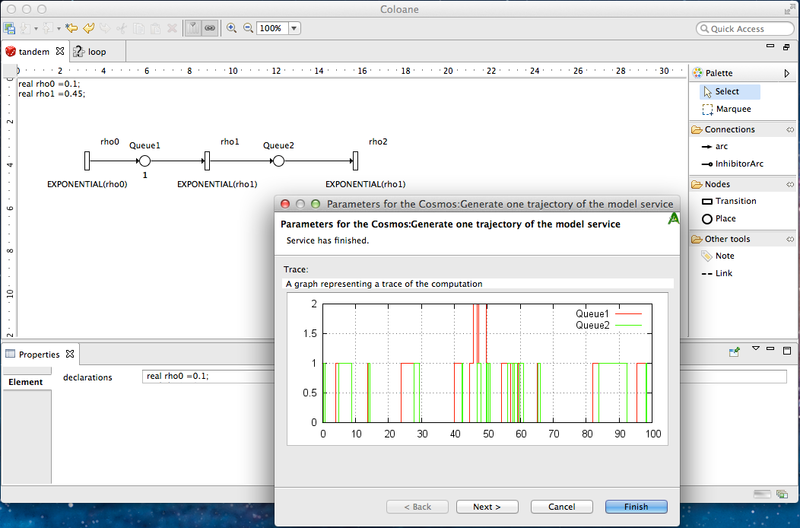 This platform provides a graphical front end named Coloane allowing one to draw GSPN and LHA with a graphical editor. Cosmos reads the GRML file format used by CosyVerif, both for GSPN and LHA. ▷Download the GreatSPN Editor and start it. ▷ Fill the windows as on the previous screen shoot. 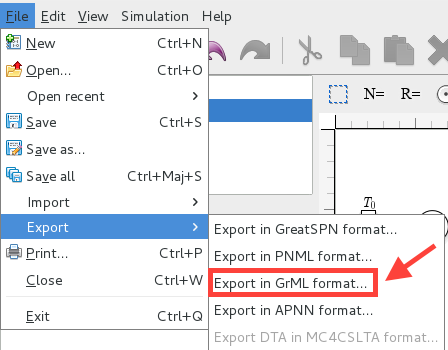 ▷Export the model in the GrML file format using the file menu/export/export in GrML. 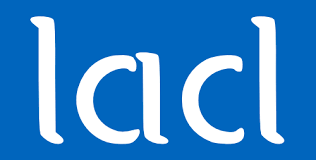 Cosmos can be used to compute simple performance evaluation indexes of a model by generating an HASL formula. This is done using the ``--loop X'' option which generates a simple LHA which loops for X time units and then accept the trajectory. ▷Open a terminal and go to the directory where you have exported the model. Where confint stand for ``confidence interval'' and are followed by the width of the confidence interval and the confidence level used for the confidence interval computation. The last two lines indicate the progress of the simulation. The first one % of Err: represents the width of the largest confidence interval with respect to the objective (given on the command line with "--width 0.05"). The second line % of run: represents the number of simulated trajectories with respect to the maximum allowed number (by default 2000000). The simulation stop when one of the goals is reached. You can stop the simulation by hitting Ctr-C.
You can visualise the behaviours of the model by plotting the mean trajectory. You can observe a well-known fact of queuing theory which is that if the rate of incoming client is not strictly smaller than the serving rates, then the system is unstable. 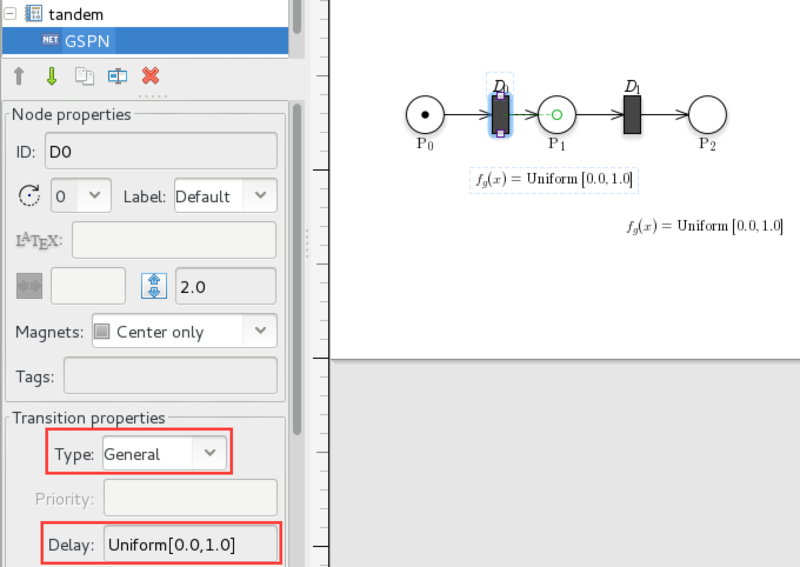 The type and parameters of transition distribution can be modified in the left panel when the transition is selected. See below screenshot. In the interface, the parameter of exponential distribution is called ``Rate'', and it is called ``Delay'' for general distribution. ▷Change the rate of transition $T_0$ to $0.6$ in GreatSPN, export the model and run Cosmos, observe the difference of behaviours. ▷Change the type of transition $T_1$ to ``General'' and set the delay to ``I[1.0]'', which stand for Dirac distribution in $1$. Change the sampling parameters to ``--sampling 10 0.1'' to plot a more precise graph. If a model does not behave as it is intended to, it is useful to perform step by step simulation. Cosmos will stop before the first step of simulation and show you the available transitions. You can write down ``s'' to perform one step of simulation, or ``fire Ti'' to fire transition Ti. 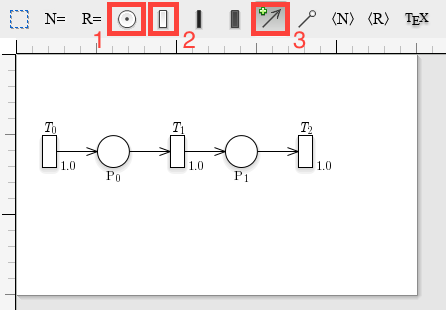 If you write ``d'' and open the file ``draw.pdf'', it will contain a drawing of the Petri net updated with the current marking. In this part we will design an LHA to evaluate a more complex property. You can look at the LHA produced by Cosmos while using options ``--loop'' or ``--sampling''. By default these files are removed with all the temporary files when Cosmos exit. The option ``--tmp-status keep'' prevent Cosmos from cleaning up, all the temporary files are stored in a directory called ``tmp'' in the working directory. ▷Look at the file ``tmp/looplha.lha'' and ``tmp/samplinglha.lha''. ▷ Build a new GSPN in GreatSPN with three places, and two transitions, set the initial marking of the first place to $1$ and $0$ for the others. Add arcs such that the only possible execution is for the token to go from the first place to the second by firing the first transition and then go to the third place by firing the second transition. Then set the distribution of both transitions to be a ``General'' distribution with delay ``Uniform[0.0,1.0]''. ▷ Can you guess the value of p ? ▷ Run Cosmos by passing the model name and the lha name. ▷ Add an HASL expression to the LHA to compute the mean value of r.
▷ For the tandem queue model, write down an LHA computing the following LTL formula: ``X ( (Q1+Q2>0) U (Q1+Q2=10) )''.